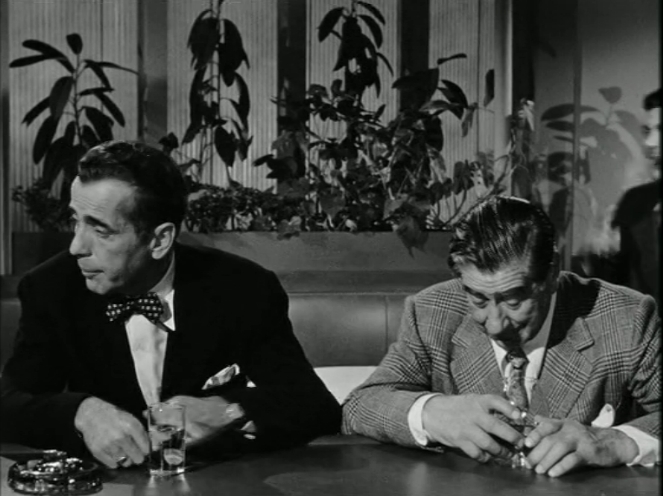 Hardboiled heroes (or anti-heroes) certainly know how to eat and drink. 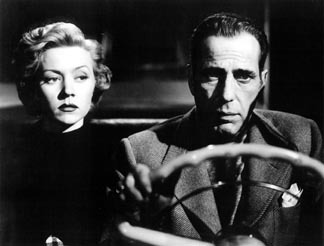 Take Dix Steele (Humphrey Bogart), the cynical screenwriter protagonist of In a Lonely Place (1950). We’re first introduced to Dix on his way to Paul’s, a Hollywood club/bar/ restaurant. He’s going to meet his agent Mel (Art Smith), who has a new project for him – the adaptation of trashy new novel. We’ve already seen Dix’s violent temper emerge en route to Paul’s, and it comes out again over drinks at the bar (a gin and tonic for Dix; a glass of milk for ulcer-plagued Mel) when a director is cruel to Dix’s friend, Charles (Robert Warwick), a washed up thespian whose career ended with the arrival of the talkies. As well as defending his friend, the accusation of being a has-been touches a raw nerve with Dix, who, we are told, hasn’t had a hit since the war. It ends with a punch up, where we again see Dix’s temper given free rein. Luckily, he’s a regular and escapes with nothing more than a warning from friend and proprietor Paul to take things outside next time. All this aggression works up an appetite and Dix orders ham and eggs, which are brought to him with some slices of toast (in mock deference Paul tells Dix he will select the eggs himself). This is the first meal we see Dix tuck into and it sets the standard for what he eats and drinks across the rest of the film, namely breakfast-type food and hard liquor. Given Dix’s erratic working hours, it’s not surprising that this all-hours sort of nourishment appeals. After his ham and eggs, he heads home with hat check girl Mildred who’s read and loved the book he’s been asked to adapt. Rather than bother to read it, he asks Mildred to come and relate the story to him. At first she thinks he’s picking her up and refuses – she also has a date that she doesn’t want to miss. But when she realises she has the chance to assist a well-known movie writer, she eagerly acquiesces. Back at Dix’s apartment, he fixes himself a strong drink and Mildred a soft one (ginger ale with a twist of lemon – she advises him that it’s called a ‘horse’s neck’). She’s briefly perturbed when he disappears to his room and returns in his dressing gown but soon relaxes when he tells her he needs to be comfortable to work and asks her to begin the story. After the briefest of summaries, Dix realises the novel is exactly what he thought it would be and sends Mildred home with cab fare and a reader’s fee. The next morning she’s found dead and Dix becomes a suspect. 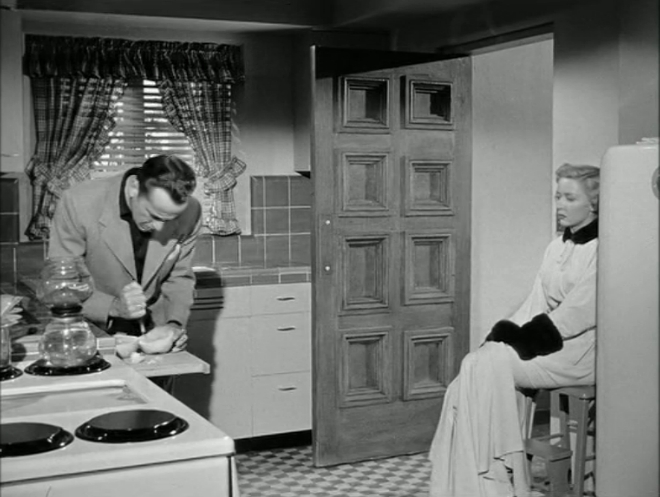 A witness in his favour is his sultry neighbour, Laurel (Gloria Grahame in one of her finest and most sympathetic performances), who saw Mildred leaving Dix’s apartment. After a short courtship characterised by wise-cracking and verbal sparring, the two fall deeply in love – despite Dix’s increasingly erratic behaviour. They are two lost souls who’ve found each other, a sentiment beautifully conveyed in the scene in which they listen to a piano singer while drinking gin and tonics together. Laurel helps Dix write again, typing up his pages and making him breakfast after a hard night’s writing. One such breakfast we hear requested but never see eaten is: ‘orange juice, eggs over easy, bacon, toasted muffins, strawberry jam and lots of coffee’. Later, breakfast grapefruit and coffee serve as the backdrop for one of the film’s most tense and heartbreaking moments as Dix proposes to Laurel. Although she loves him, the suspicion that he may have murdered Mildred, combined with his violent tendencies and rumours that she hears about his past, causes Laurel to realises she can’t marry Dix. As Dix cuts up a grapefruit he discourses on the technique of writing a love scene for the movies. It’s a wonderfully self-reflexive scene as he tells Laurel that you can’t just have characters tell each other that they love each other. He suggests that if this scene was in a film, it would be immediately apparent how deeply in love they are, conveyed through the simple act of making and talking over breakfast. The irony is that we can see how disturbed and tormented Laurel is, unable to refuse his proposal for fear of what he might do if rejected. She tries to break the moment by exclaiming ‘the coffee!’ and dashing back into the kitchen to rescue to pot from the stove (a suction method coffee, if not an actual Cona). But it’s to no avail. She and Dix become engaged and host a celebratory dinner at Paul’s that ends abruptly, ruined by Dix’s jealousy and paranoia. 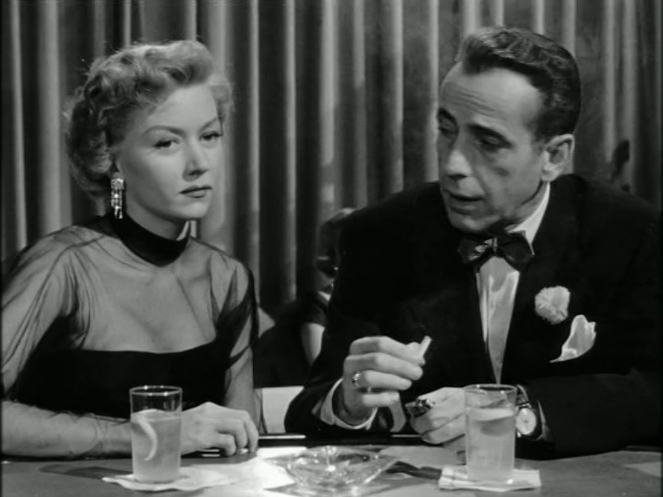 Paul’s was based on Romanoff’s, one of Humphrey Bogart’s own hangouts, and in fact, the character of Dix (self-destructive, sometimes cutting but also loyal to his old friends) has much in common with Bogart himself. 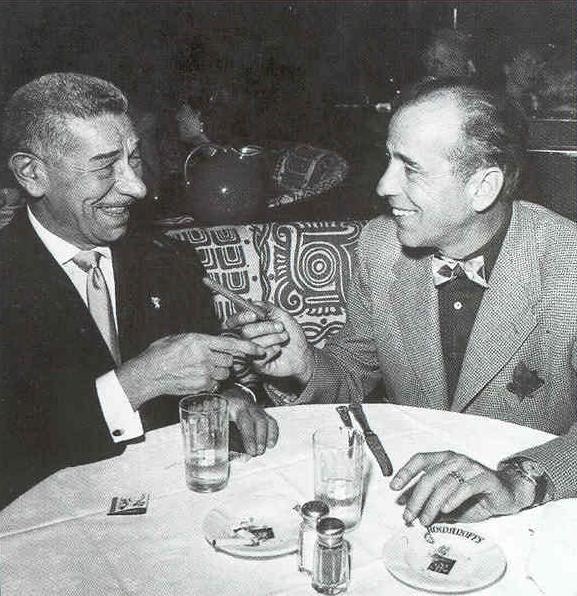 One of Bogart’s biographers describes Bogie’s regular trips to Romanoff’s, where he always occupied the second booth from the left and frequently ordered ham and eggs which he’d happily order at both breakfast and lunchtime. When he wasn’t filming, he’d generally arrive early for lunch, giving him time for a drink (scotch and soda), before eating around two o’clock and then indulging in a game of chess with Mike Romanoff. ‘He drove over to Wiltshire, not knowing where he’d eat. The Savoy, on up Rodeo, Romanoff’s, the Tropics. He was after good food, but he didn’t want to waste a lot of money on it. Not until Laurel went with him to those spots. There was always the Derby or Sheetz – not for tonight. Neither could fill the hollow within (pp. 139-140). The film is a loose adaptation – in the original, Dix is a serial killer whose world and mind we are drawn into and forced to share. He’s a handsome young ex-veteran and aspiring writer, but is certainly not a screenwriter. He dismisses the idea as being something he’d only do if desperate for money when Laurel (much harder and less sympathetic in the book) asks him about his writing career. This Dix also has an appetite, which increases when he’s feeling tired or anxious – particularly about Laurel’s increasing coldness towards him (like her cinematic equivalent, she’s scared of him). 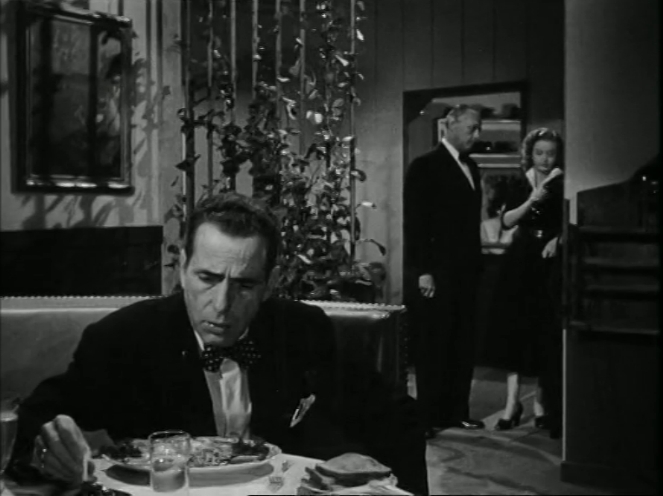 There are some lusty descriptions of food in the literary A Lonely Place – on two occasions he eats the classic American combination of ‘salami and swiss on rye’ – and after Laurel has failed to show up for a date, he begins to fantasise about ‘dinner, a big hearty, tasty dinner. Steak and French fries and asparagus and a huge fresh green salad, then a smoke and coffee and something special for dessert, strawberry tart or a fancy pastry and more coffee’ (p. 157). Perhaps he goes to eat some ham and eggs. 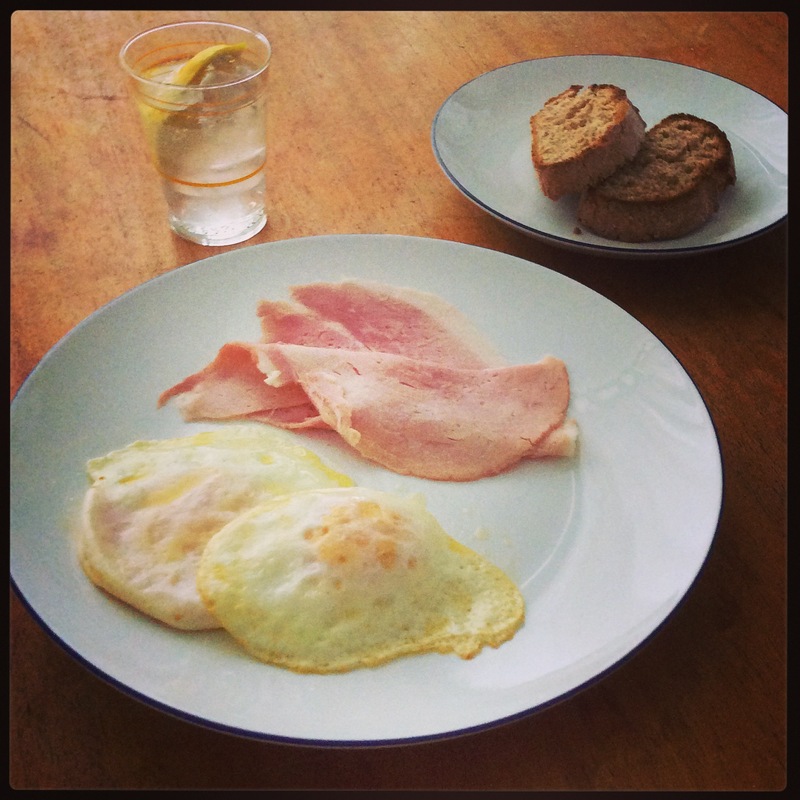 Here is my own effort at breakfast with Dix Steel: Ham and eggs over easy, served with a gin and tonic. Eggs over easy is such a fantastically American-sounding dish that conjures up images of diner-style food. I’ve never tried making them before, but my current favourite cookbook, Marc Grossman’s New York Cult Recipes, gives detailed advice on the best method. My short version is: cook for 2 minutes and then gently turn over and cook for another 20 seconds. I broke my first yolk but Marc advises: ‘If you practice enough, making eggs this way will eventually come naturally. Along the way, you can consider eggs over easy as an exercise in gentleness’.